The Orthomolecular Medicine News Service (OMNS) published on June 12 “The Need for Iodine Supplementation.” We believe strongly in the need for iodine supplementation, especially given the fact that more than 90% of the US population is iodine deficient. For this reason we make available both Nascent Iodine and Lugol’s Iodine Solution 2 to our customers. We present the full OMNS article (below), as a source of valuable information to our resellers and Creating Health Naturally readers. The factors contributing to massive-scale iodine deficiency remain virtually unchanged over decades. 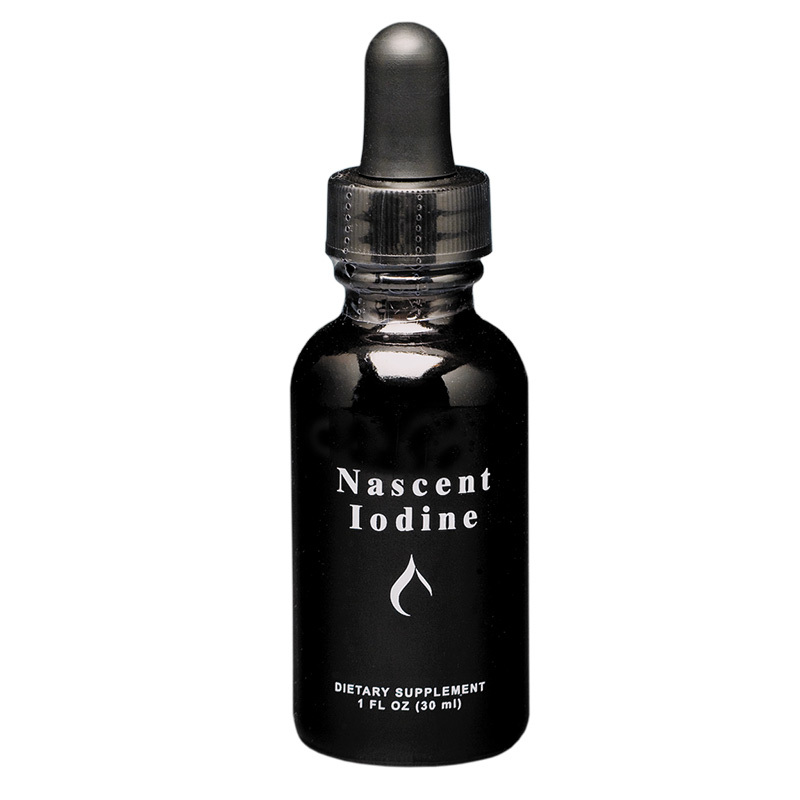 This has led to a greater need for educating health professionals and individuals about the critical importance of iodine supplementation. (OMNS, June 12, 2017) Feeling tired, having low energy or depression, gaining weight, memory problems, having dry skin, dry mouth, or immune system issues? There is good chance your body needs iodine supplementation. Why iodine? Because this essential to human health element has been singled out as dangerous, for several obscure reasons, and it has been gradually eliminated from our diet, and even worse, replaced by its antagonist, bromine. This trend has been termed, iodophobia (1). It is a cause of widely occurring hypothyroidism in many developed countries. The Food and Agriculture Organization (FAO) of the United Nations has published probable safe upper limits for dietary intake of iodine (5). They range from 150 micrograms (mcg) per kilogram (kg) per day in newborn infants to 30mcg/kg/day in adults. That is 2 milligrams (2,000 micrograms) daily for a 146-pound adult. The safe upper limit is higher during pregnancy and lactation (40 mcg/kg/day). The simplest method to deal with an underactive thyroid is proper supplementation with iodine, called orthoiodosupplementation. If the thyroid is damaged, then supplementation with thyroid hormones, thyroxine (T4) and triiodothyronine (T3, the main biologically active hormone) may be necessary. 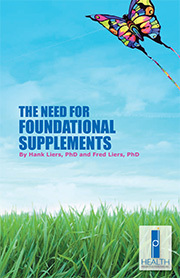 Supplementation (6). with these hormones should be done under close supervision of a medical professional. However, supplementation with inorganic iodine is generally much safer, as the body “knows” how much T4 and T3 need to make. There are also drugs that change physiology of iodine metabolism, but this subject is beyond the scope of this article. Pharmaceutical companies pressure doctors to avoid inexpensive orthoiodosupplementation, so you won’t likely get a prescription for inexpensive Lugol’s solution from a mainstream practitioner. One caveat to supplementation with iodine is the autoimmune illness called Hashimoto’s disease, or chronic lymphocytic thyroiditis, which is one of the potential causes of hypothyroidism. Unfortunately, when hypothyroidism is diagnosed, the possibility that Hashimoto’s disease underlies this condition has not always been properly tested. Therefore, Hashimoto’s disease has often been misdiagnosed. Doctors usually treat this condition with hormone replacement therapy, and some believe that excessive iodine intake may trigger it in susceptible people (7). Always ask your doctor if iodine supplements are right for you. This subject has been covered in detail by Dr. Guy E. Abraham (8,9,10). The iodine element was discovered in 1811 by B. Courtois. In 1850–1853 A. Chatin noted that goiter and cretinism are rare in geological zones rich in iodine and frequent where iodine is in short supply, and that goiter can be prevented by iodine supplementation. In 1895 E. Baumann proposed that iodine is the active element in the thyroid gland. By the time Bauman identified large concentrations of iodine in the thyroid gland in 1895, pharmaceutical and apothecary preparations containing iodine, excluding thyroid extracts, were widely used as a panacea. Unfortunately, these monographs have virtually disappeared from US medical libraries. In the mid-1800s, iodine treatments of some diseases called for ingestion of gram (1,000 mg) amounts per day. However, most treatments were from 5 to 50 mg daily. The recommended daily amount of iodine by Dr. G. E. Abraham is 0.1-0.3 ml Lugol containing 12.5-37.5 mg elemental iodine. This is the amount of iodine needed for whole body sufficiency, based on a recently reported iodine/iodide-loading test (12). Thyroid gland sufficiency for iodide is achieved with a lower dose. The first iodophobic authority emerged in early 1900s. Prof. T. Kochler reported that he suffered from overactive thyroid following ingestion of iodide (just a single individual case, not a statistical research study!) Despite this, the number of applications grew. In an International Index published in 1956, and devoted exclusively to iodine pharmaceuticals, no less than 1,700 approved iodine-containing products were listed. In 1948 Wolff and Chaikoff published that a serum inorganic iodide level at a concentration of 1 µM blocks (one micromolar) the synthesis of thyroid hormones, resulting in hypothyroidism and goiter in rats. But this conclusion was erroneous as they even did not measure thyroid hormones in the rats studied, and of course, hypothyroidism and goiter were not observed in those rats. Many organic forms of iodinated drugs were quite poisonous. Unfortunately, medical establishment did not make a distinction between organic and inorganic forms of iodine, and iodophobia became more popular. Decades ago, iodine was added to bread so that one slice contained 150 mcg of iodine (the current recommended daily allowance). In the 1980s, bromine replaced iodine in bread. Since bromide is an antagonist to iodine (it is goitrogenic), it worsened iodine deficiency in the US. Moreover, a big push to remove salt from our diet (the only grocery item still supplemented with iodine) exacerbated the problem. The only developed nation that resisted iodophobia is Japan, statistically the healthiest and longest living nation on the planet. Their average daily consumption of iodine is around 5 mg, with various reports ranging from 1 mg to 18 mg. In a study of reported daily iodine intake versus total number of clinical symptoms, an intake of approximately 1 mg per day correlated with the lowest number of reported symptoms, that is, the highest level of health (13). Recent popularization of bromides in our food supplies likely increased this amount. Unfortunately, the recommended daily allowance (RDA) for iodine — about 150 mcg per day — will not allow delta-iodolactone to be efficiently formed in the thyroid gland. The thyroid requires higher iodine concentrations to efficiently produce it. Researchers have found that 100 times the RDA amount of iodine is optimal to produce delta-iodolactone. That equates to taking about 15 mg of iodine per day (15,16). These findings are important because they imply that there are some biochemical reactions that require much larger amounts of iodine than the current RDA. The mechanism by which delta-iodolactone induces cell death may be an important pathway for curing some types of cancer. Inorganic iodine exists in 6 oxidative states, from -1 to +7. The most reduced form (with most electrons) is iodide (I–); an example is potassium iodide. The diatomic form of elemental iodine I2, has no electrical charge. Monoatomic iodine also has no electrical charge, but is unstable and highly reactive (free radical, labeled as an I with a dot, I* ). It can be produced by exposing I2 to ultraviolet light. Electric and magnetic fields won’t do it, as is sometimes incorrectly suggested. More oxidized forms of iodine are: hypoiodite (I+1), iodite (I+3), iodate (I+5), and periodate (I+7). The body’s metabolism may convert (reduce) these forms to biochemically available iodide, but at the cost of depleting its antioxidants. All forms of positively charged iodine are relatively poisonous, with established lethal doses (LD50) in the range of 35 to 2100 mg/kg. Elemental iodine (I2) and iodides (I–) are non-poisonous. However, a bad “antiseptic” non-culinary taste of iodine (I2) suggests to our senses that this is not so good choice for supplementation. Despite that adverse taste, almost all the research on iodine supplementation has been done using Lugol’s Solution (17). The original solution is called 5% Lugol’s Iodine, but in reality it consists of 12.5% iodide/iodine or (I–/[I3]–) ions. 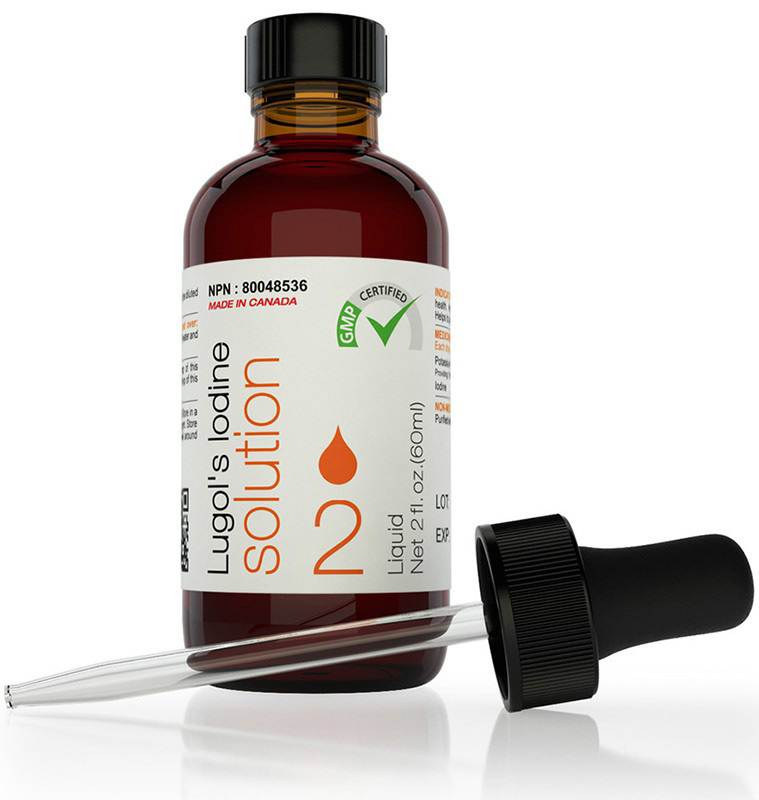 Two drops of Lugol’s Solution (0.1 ml) contain 12.5 mg iodine/iodide mix. Iodine tablets that are a solid form of Lugol’s solution, were created to mask the taste and make the doses more precise for dietary supplementation. I should mention a few points about Edgar Cayce’s atomidine. This famous visionary wrote several articles about the best form of iodine supplement (18). Some claim that this was iodine trichloride, but that cannot be true as this compound is toxic by ingestion and damaging to mucous membranes. It decomposes to ICl and poisonous gas Cl2 at 77 degrees C and also in water at room temperature (19). Most likely Cayce’s atomidine was simply a 1% iodine solution (I2) in 95% ethanol. I am surprised that there are educated people, even medical doctors who claim that “elemental monoatomic iodine” preparations (Atomidine, Nascent Iodine etc.) are the best forms of iodine supplements. May be it has something to do with efficient marketing? Elemental Iodine (I2) is soluble in glycerin. Replacement of ethanol with glycerol indeed makes these supplements more consumption-friendly, so they are sold by some vendors as superior products to Cayce’s ethanol-formulated one. Personally, I think glycerol-based I2 supplements are inferior to iodides; however, they are excellent antiseptics. To defend the validity of Cayce’s vision, in thyroid, I– ion and amino acid tyrosine react through a short intermediate step by forming monoatomic I* free radical (selenium and hydrogen peroxide are involved) to make monoiodotyrosine. Diiodotyrosine is formed analogical way, and finally, two of these molecules combine to produce thyroxine. All those steps are carried by the enzyme thyroid peroxidase, which is normally attached to the protein thyroglobulin. So, yes, monoatomic iodine I* exists in human bodies, and it directly reacts with tyrosine, but no, it wouldn’t be healthy to consume iodine free radicals as their high reactivity would prevent safe transport throughout the body. In the mid-1930s the thyroid hormone thyroxine became available on the market. This was a blessing for people who had damaged their thyroid. Unfortunately, doctors started to prescribe this hormone to just about anybody with hypothyroidism, thinking that they can control better thyroid hormone levels than our bodies can. And, the “iodine is iodine, no matter what form” mentality became a dangerous trend, because most medical professionals do not fully appreciate the difference between the raw nutrient (iodine) and its product (hormone). The pharmaceutical industry came up with lots of organic forms of iodine (NB: organic, meaning that iodine is bound to a carbon-atom-containing molecule and NOT meaning it’s grown in a pesticide-free environment), all relatively toxic and certainly not to be used without strict medical supervision. 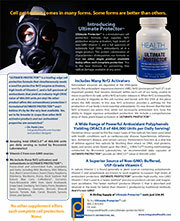 Only inorganic forms of iodine, I– and I2, are safe for supplementation (20,21). Further, high doses of these supplements should still be supervised by your doctor. Iodine plays critical role in human metabolism. Many researchers believe the RDA value of 150 mcg for iodine is too low, especially when this element is commonly substituted with competing element bromine. Therefore, the main use of iodine in dietary supplementation is to enable optimal thyroid function. There are a number of medical conditions where iodine is either essential or helpful. For best results, iodine/iodide should be supplemented with selenium, magnesium, copper (there is usually enough of it in tap water as copper is widely used in plumbing), vitamin B2 (riboflavin) and B3 (niacin). Ask your doctor before taking any iodine supplements, especially if you are on medications. Elemental iodine (I2) is antibacterial and antifungal, so iodine or iodine/iodide solutions are commonly used topically to sterilize wounds, or internally to fight infections, such as vaginitis and sore throat, and also to sanitize drinking water. Because iodine is antibacterial, drinking it may cause friendly bacterial flora to suffer and result in diarrhea and stomach cramps (the same applies to Lugol’s solution, but to a lesser extent as it contains iodides as well). Ingestion of iodides prevents the incorporation of destructive radioactive iodine into the body (mainly by the thyroid) in case of nuclear accidents. It also may help flushing already incorporated radioactive iodine from the thyroid, although too much iodine inhibits secretion of T4/T3 from the gland. The most common form of iodine supplement is Lugol’s solution (17). The original solution contains 5% of iodine and 10% iodide. Solid pill forms of Lugol’s solution are sold under several brand names. Potassium iodide (KI), my favorite iodine supplement, is available as tablets as well. Various products with kelp or other seaweed extracts contain iodides as well. Check the label when you buy as some of them are very diluted. It is difficult to find inexpensive elemental iodine (I2) solution in alcohol. You can buy iodine crystals online and make the proper solution by yourself very easily (using either alcohol or glycerol). The monoatomic iodine concept is simply a marketing gimmick that has been created to inflate the price several fold. Note that if the monoatomic claims were really true, few would really want to drink free radicals, the only monoatomic form that exists. Iodine free radicals are not transported freely in our bodies because they are too reactive. Elemental iodine preparations, including iodine dissolved in glycerol, may be helpful products for external antiseptic use rather than a supplement. The established RDA allowance for iodine (150 mcg/day) is inadequate for many individuals. In order to maintain optimum health, adults need 2-5 mg of iodide daily. Actually, this is in line with the upper safe limit of dietary intake of iodine established by FAO (30 mcg/kg/day). In case of a dysfunctional thyroid or other illnesses, such as fibrocystic breast disease or cancer, 15-50 mg daily may be needed. Ask your doctor about the alternatives to hormone therapy or taking iodine-containing organic drugs, because inexpensive orthoiodosupplementation would usually not be his/her first choice. The best and safest form of iodine supplementation for a healthy adult is iodide. Iodides are naturally produced in larger quantities by various seaweeds. Please consult your doctor about iodine supplementation, as in your particular case it may be contraindicated.